The Lewis Chessmen, found in a sandbank in 1831 on the Isle of Lewis in Scotland's chilly Outer Hebrides, remain a mystery. They were found by a peasant who thought they were gnomes and fled, but then told his wife, who made him retrieve them. Or, they were carried to safety by a shipwrecked sailor, who was murdered by a herdsman, who buried them, and then found by a peasant; or, they were stolen from sailors by a boy who jumped ship, but was killed by a herdsman, who buried them. Later a peasant's cow unearthed them with its horns. Historians may never resolve the precise history of the little ivories, none taller than four inches. 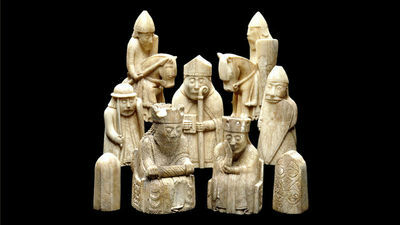 But what experts do agree on is this: A carver in Trondheim, Norway, probably made the chessmen about 850 years ago, and they're exquisite pieces of both art and history. Neil MacGregor, the British Museum's director, recently selected them for his popular book and radio series "A History of the World in 100 Objects." Miri Rubin, a professor of medieval history at Queen Mary College, University of London, notes that while everyone knows about the ancient Mediterranean, the chessmen highlight "a developed sphere of North Sea trade, manufacture and exchange that is often ignored." Made of walrus tusk or whale's teeth, the Lewis Chessmen come from four distinct but incomplete sets. They're creamy white, though traces of red—not black, as in chess today—remain on some pieces. In his book, Mr. MacGregor explained that as the game of chess spread from its origins in seventh-century India, the pieces evolved to reflect the people who played it. The Lewis pawns are little slabs, signaling their place at the bottom of society. At the opposite end, the kings sit on elaborate thrones, swords across their laps. Queens, replacing the viziers of Islamic chess sets, are wise but gloomy counselors, staring into the distance with their chins in their hands. Mitred bishops, the earliest surviving examples, have replaced the elephants of Indian chess, a statement of their lofty social status. Most intriguing are the "berserkers," who occupy the place of rooks. Fiercely chewing their swords, they show "the terrifying world of Nordic warfare," Mr. MacGregor says. The Cloisters, the Metropolitan's medieval art branch in the far north of Manhattan, will display the pieces in "The Game of Kings: Medieval Ivory Chessmen from the Isle of Lewis," beginning Tuesday. These miniature sculptures will be arranged in the endgame of a famous chess match, with the fallen pieces removed to nearby vitrines (with examples of other medieval chessmen from the Metropolitan's permanent collection displayed nearby). When the exhibition closes next April 22, the Lewis chessmen are going right back to Britain.